The Crossfire II rifle scope line is the entry level line from Vortex Optics. As the ‘II’ indicates it’s the second generation of these scopes. They come in a variety of models ranging from one inch tubes to 30 mm tubes. The magnifications range from 1-4x24mm to 6-24x50mm. All models with a 1 inch tube offer a 3x magnification range (2-7, 3-9, 4-12, 6-18) while all scopes with a 30mm tube have a 4x magnification(1-4, 3-12, 4-16, 6-24). Lens diameters range from 24 mm to 56 mm. Click here now for the lowest price and availability on Amazon! There should be no shooting and hunting situation that wouldn’t be covered by one of those scopes. As already mentioned, these scopes are the entry-level line from Vortex and are as such affordable in price. Yet, they’re not made or designed cheap so you can rest assured that you get a good deal. We’re having a closer look at the 4-12x44mm scope in this review. At the end of this review we’ll list all scopes with their technical specifications in case you want to consider another scope out of the Crossfire II lineup. The Crossfire II series has a scope for pretty much every situation. 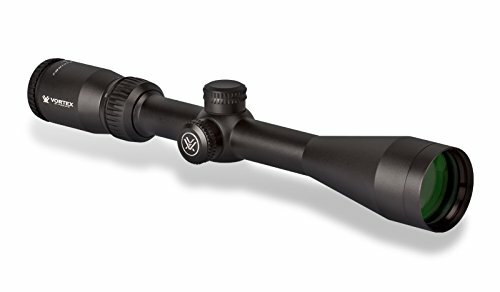 They are the entry-level scopes from Vortex that are affordable yet offer high-quality design and materials. The main tube features one inch in diameter as most scopes in that price range offer. It’s made from aircraft grade aluminum. It’s hard anodized in a matte black to prevent glare and light reflecting off of it. On top the tube is filled with nitrogen to prevent any kind of fogging on the inside. It’s also sealed with O-rings to keep water, dirt and dust out. The optics are multi-coated to provide maximum light transmission. The coatings also reduce reflection of light on all surfaces that get in contact with air. This improves the low-light visibility while also making sure that you’ll get a great image in bright sunlight. You can get this scope with either the V-Plex or the Dead-Hold BDC reticle. The reticle is on the second focal plane. For long-range shooting you might be better off with the BDC reticle but it does end up being personal preference and what you are used to. The field of view at 100 yards is 24.7 feet with a 4x magnification. At the maximum magnification of 12x the FOV is 8.4 feet. The objective diameter is 44 mm which provides enough space to let a lot of light into the scope. The sharpness of the lens is good and falls off at the edges. As you’re not targeting at the edges but in the center this is not an issue when you’re aiming. The eyepiece is designed to allow for fast focus and target acquisition. This allows for fast switching from one target to the next. In combination with the sharp image allows to aim quickly for shots with great accuracy. The exit pupil ranges from 3.67 mm up to 11 mm. That allows for a lot of light to hit your eye under any lighting circumstance and magnification. It’s hard to find a scope in this price range that would be able to beat the Crossfire II. Have a look at it and you’ll know that you get a great value and high quality. You won’t be disappointed! The turrets on all Crossfire II scopes are capped and feature a zero-reset. Adjustments are ¼ MOA per click. A full rotation adjusts by 15 MOA. The maximum elevation and windage adjustments are 50 MOA. The parallax settings are fixed at 100 yards. In the AO models the parallax is adjustable to provide an even sharper image. The eye relief on the Crossfire II 4-12x44mm is 3.9 inches. That is sufficient for most rifles for hunting. The adjustments are very accurate. Probably more so than what you’d expect for a scope in this price range. The Crossfire II line of scopes offer a great compromise between affordability and features. The large amount of different scopes in this family will make sure that you find a great hunting optic for your needs. The quality is great. The scopes are sturdy and hold zero well even with strong recoil. The optics do not let you down while you certainly have to consider that you get higher glass quality in higher end scopes. The turrets are easy to use and sturdy. Many other scopes in that price range offer lower quality turrets and overall scopes. You’ll find the Vortex Crossfire 2 scopes with many retailers. You can get them online or at specialty retail outlets. Usually you will find the lowest price and best availability by getting them from Amazon.com. Click the button below to get the details. Seeing that these rifle scopes are very affordable, you will find a lot of customer reviews online. The amazing thing is that you will basically not find any bad reviews. You can check out the reviews on Amazon when you click the link. These are people that bought and use the scope that are quite happy with it. Vortex offers a large variety of scopes within the Crossfire II lineup. The table below shows all of them and provides you with convenient links to Amazon to check the current availability and find the lowest price. The Vortex Crossfire 2 4-12x44mm scope is a great all-around scope for medium to larger distances. It’s a step above the 3-9x scopes and provides excellent value for the price you pay. There’s nothing much bad to find or say about this scope. It’s robust, easy to use and will not let you down. Sure, there are better scopes out there with better optics but they certainly do cost you a lot more. The price point puts the scope square against the Nikon Buckmaster II series. The Vortex might be slightly better in our opinion though.